I’m thrilled to have my friend and honorary little brother, Stacey Little from SouthernBite guest posting today! I know y’all will enjoy visiting with him as much as I do! 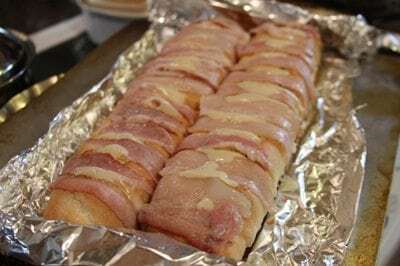 To follow along on my progress, you can check out my latest journal entry by clicking here, but be sure you check out this yummy Swiss Bacon Bread first! Ever since the accident, I’ve been begging Christy to let me help with something. After a few weeks of pressure, she’s finally breaking down and letting me do a few things to help. And in typical Southern belle fashion, she’s been so grateful. In fact, in a text the other night, she mentioned that she couldn’t believe I would be so willing to help her out. Honestly, I would do anything she asked. But the more I thought about it, I realized that there are often blessings in tragedy. Good comes out of folks when bad things happen. Christy has been fortunate to have folks bring her meals and send her sweet gifts and messages. That’s what friends do. She’s has been such a blessing to me and others in so many ways, I wanted to be able to return the favor. Christy is the eternal optimist, as you well know. After all of this, her outlook has remained as sunny and chipper as ever- maybe even more than before. We all can learn so much from her. No matter what we face in our lives, things are a lot more tolerable if we go into them with the right mindset and a chipper disposition. It’s like mama always said, “You’ll catch more flies with honey than with vinegar.” I think the same rings true here. Christy’s making the best of her situation. Something tells me there’s something in your life that you could change your attitude about, too. I know there is in mine. Each of us is a work in progress, remember. This recipe is special because it’s my Mom’s. I love sharing my food with y’all, but I love sharing her’s even more. It’s ooey, gooey and filled with bacony yuminess. We love it and I’m sure y’all will too. One of my readers even said she made it and served it for breakfast. I guess it does have bacon! 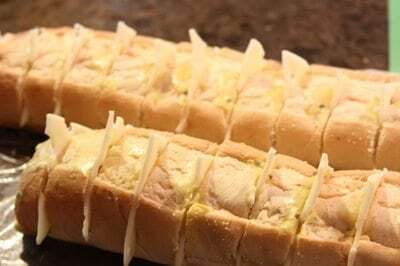 You’ll need: French bread (two small loaves like the ones above), melted butter, prepared yellow mustard, dried chives, sliced Swiss cheese, and some bacon. Mix the melted butter, mustard and chives together and set aside. Next, slice your bread into 1 inch pieces, but be careful not to slice all the way through. You want some left at the bottom to hold it all together. Next, spoon your butter mixture into the cuts you made in the bread. 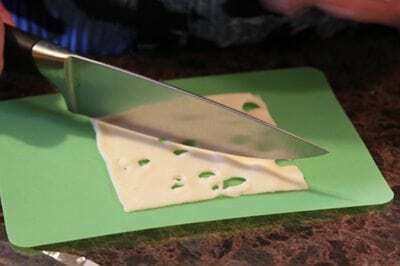 Next, cut your sliced Swiss cheese into quarters. 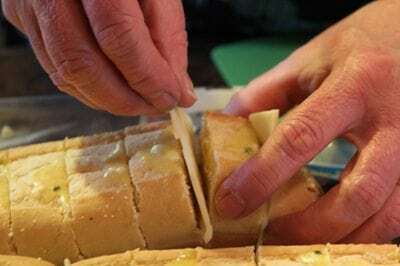 Take a piece of the quartered cheese and insert it into the slits in the bread. 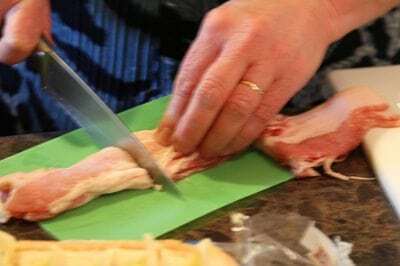 Slice your bacon in half, then slice the halves into half long ways to make long strips. 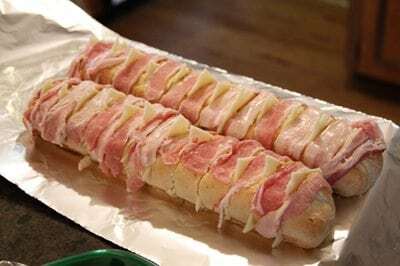 Lay a strip of bacon over each slice of bread. 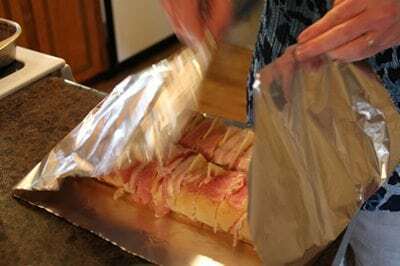 Wrap the loaves in foil and bake at 400 degrees F for 20 minutes. Remove from the oven and turn back the foil. Now broil on low until the bacon is crisp. Serve hot. 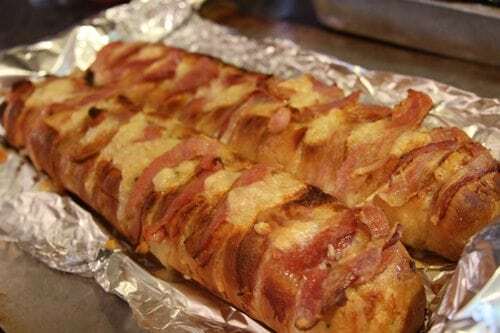 Please note: The amount of bacon and cheese you’ll actually use will depend on how big your loaf of bread is as well as how many loaves you use. You will not need all 8 oz of cheese or 12 oz of bacon, but this should give you plenty regardless. I’d recommend not cutting it all up in case you don’t use it all. 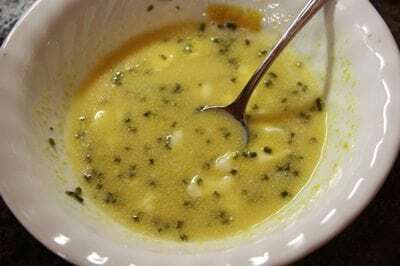 Melt butter and stir in mustard and chives; set aside. 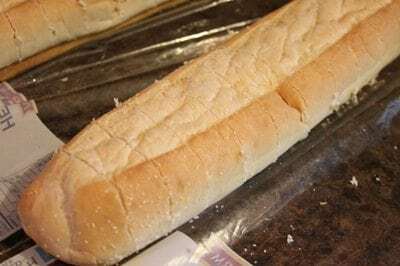 Slice bread into about 1 inch pieces without cutting all the way through the bread. 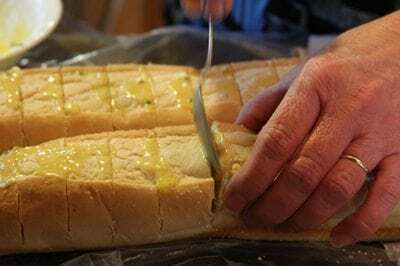 Using a pastry brush or spoon, spread butter mixture in the inside of each slice of bread. 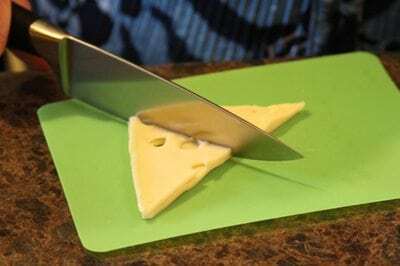 Cut Swiss cheese into quarters and place one piece in between each of the slices. 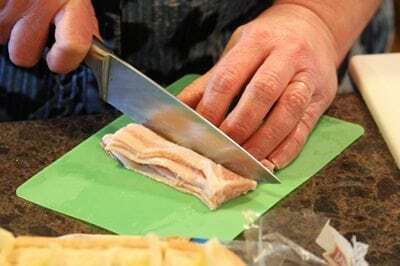 Cut bacon strips in thirds, then lengthwise. Place a strip on each slice of bread. Wrap in foil and bake at 400 degrees F for 20 minutes. Remove from oven and pull foil back, broil on low until bacon is crisp. OMG! This sounds great! Thanks Stacey, I follow your blog too! YUMMMMY!!! If it has bread, Swiss and of course PORK. . . has to a winner!! Love the sound of this one, I’m making it tomorrow, too!! Yum, love bacon and swiss cheese. Sounds like a winning combination. Any time of day would be wonderful! Great attitudes always welcome here, and the recipe looks wonderful, too! This looks really good. i like that it’s a one time assembly and in the oven it goes. i want to try it with a pot of bean soup. first, we’ll have to get through these 90 degree days though! Oh! With bean soup….What a great idea! (And weather cool enough for soup sounds good, too.) Thanks for adding that suggestion, Rick. Welcome Stacey, we are so blessed to have Christy and now you as well. I made your bread except I didn’t have any Swiss so I used Colby jack. was way too YUMMY thank you for the recipe. Oh also we don’t like mustard so I used a little Italian dressing. 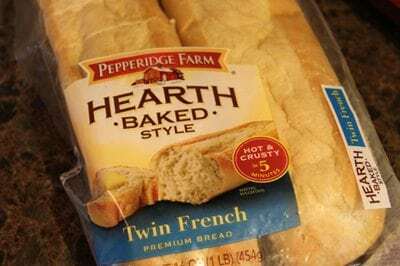 I always have plenty of small loaves of french bread in the freezer as the sandwich shop Jimmie John’s sells their day old bread for 49 cents a loaf so I buy about 10 loaves at a time cut them in half put them in a jumbo size zip bag. Then I have plenty for subs, garlic bread, crostini, cheese bread or a sudden yummy recipe like yours. Come and visit Christy’s fans again. We all love and pray for her well being daily. Wishing you well Christy thank you letting Stacey visit. This looks like a version of cheesy bread my mama made when we grilled out – only like the ramped up, extra fancified special occasion version. Sounds delicious! I’d better wait until some kids come home to visit before making it though because these empty nesters don’t need to eat all of that! Oh, holy goodness! I can’t wait to make this for my family! This is a great brunch recipe. I make it using Canadian cheddar and sliding thin slices of sweet onion into the slit instead of Swiss. Two great tastes on a brunch table with a bowl of boiled eggs, a platter of scrambled and a couple of big baskets of fruit filled muffins. Mmmm. Ohhhh. Mmmmmm. Tastebuds are pleading with me already!! Adding this to my recipe box – ohhhh – goodness is all I can say. Stacey – bless your sweet and true heart for continuing to offer help until Christy was ready to accept it. We are all learning things by listening to her heart speak during this healing time. sounds perfect to me for breakfast, with some scrambled eggs! or a swiss/spinach/bacon omelet. Hmmm. For those of us who are not fans of Swiss, I bet cheddar would be good. And I’d have to ditch the mustard for kids. Hey Linda! Winners were posted on the post and Facebook and notified by email yesterday. Yummo!!! This looks sinfully delicious!!!! This sounds like a winner! Bacon, cheese, butter, chives and bread! What’s not to like, lol! I’m not a big fan of Swiss cheese, although I do like baby Swiss since it is not so strong, but I am betting that any cheese the baker likes would be wonderful in this recipe! I also would use the prepared mustard and I encourage those of you who have children or yourselves who don’t “like” yellow mustard, to give it one try! I’m betting that if you don’t tell the kids, they will only notice how good this tastes! Yellow mustard is wonderful in certain recipes and not recognizable as the “yellow” stuff on wieners and burgers. I know the yellow color and sharp (sometimes) taste can be a turn off for some, but when mixed with butter…it’s a whole new animal! Meanwhile, get well soon Christy, as soon as those bones can heal, and thanks Stacey for helping her out, and this awesome recipe! This looks and sounds delicious and super easy. I don’t like Swiss, but will definitely make it substituting muenster. ooh, can’t wait to make this! Looks really scrumptious, Stacey! 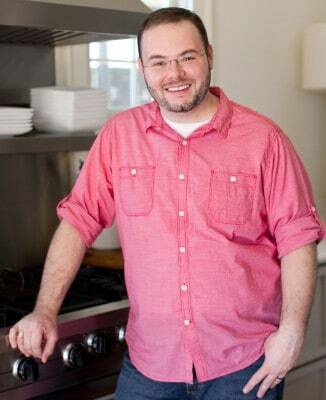 I’ve been following your site for a bit now…and I like your recipes alot! I love Christy to bits (even though I’ve never met her) but I think any friend of hers is a friend of mine! 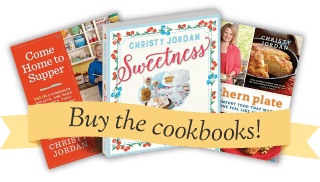 Best wishes with your cookbook….I plan on getting me one! Thank you for helping our Christy! This sounds wonderful!! Looks yummy! I was wondering how it re-heats. My husband goes to work early and doesn’t eat breakfast at home. I thought I might try it to send to work with him to have for his morning break. Wow this sounds great!! I will try it this weekend!! !